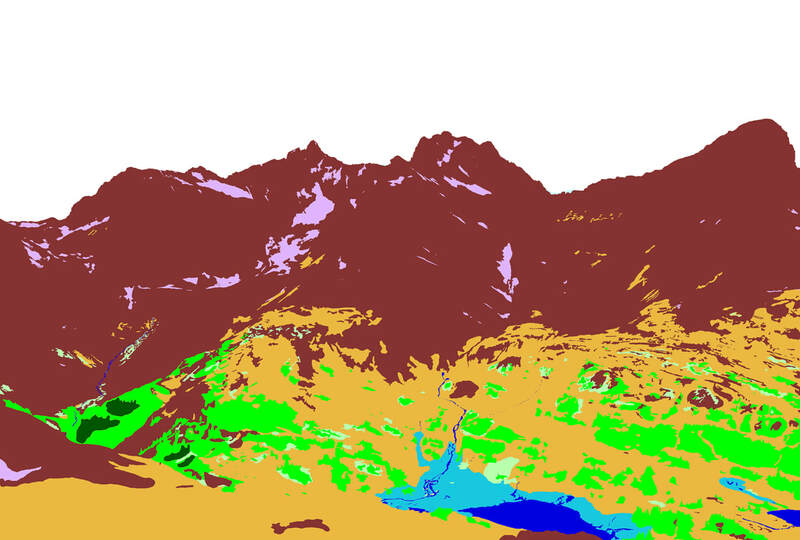 Click the corresponding arrow to select either a row or column of images for comparison in the Image Analysis Toolkit. The photos in this image pair look northwest. The historic images were taken in 1911 by A.O. Wheeler. The Google Map shows the location of the station, the direction of view for this image pair, and the general area covered. Figure 1: The view looking north-northeast from Stn 8, Moose Lake West. 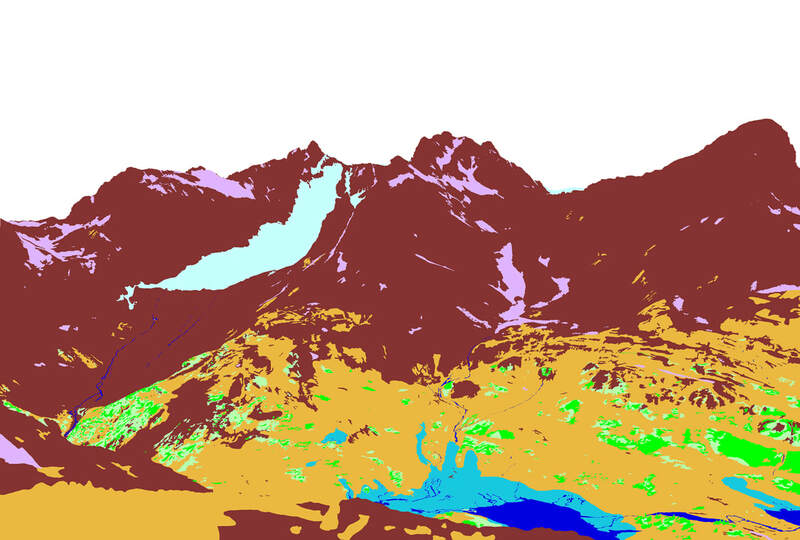 Taken together, all of the images at Stn 8, Moose Lake West are an excellent example of the geography and vegetation cover that make up the alpine and sub-alpine zones in Mt. Robson Provincial Park. 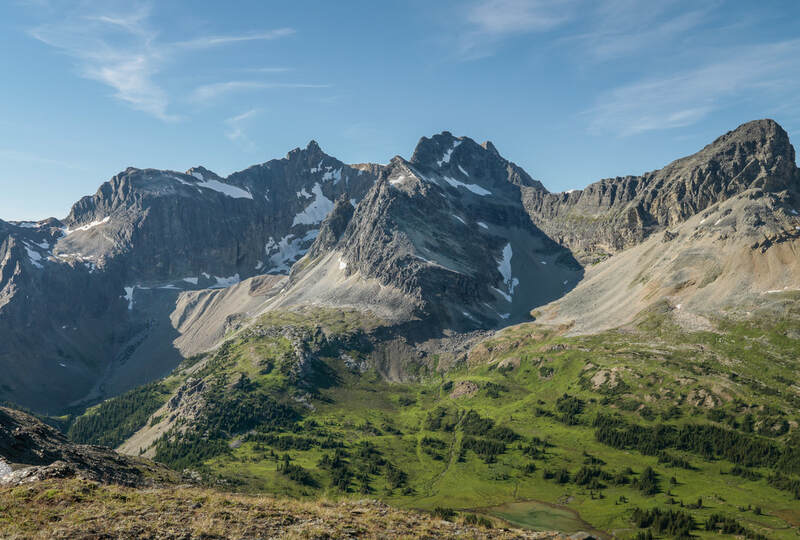 Figure 1, which uses four of the images in a panoramic view, shows a classic U-shaped valley, upland herbaceous meadows and wetlands, streams, Engleman Spruce - Subalpine fir, alpine treeline ecotone, exposed rock, and glaciation. 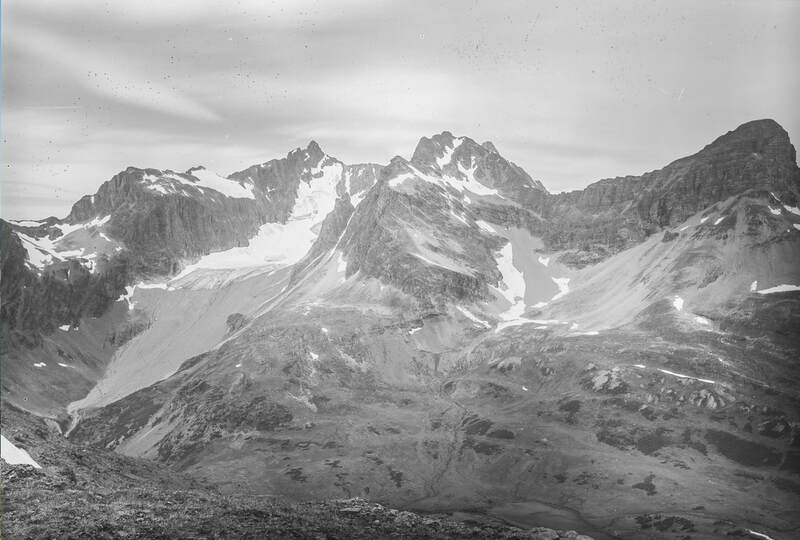 Concentrating on image pair WH2-16 / MLP2-16 (the leftmost side of Figure 1) perhaps the most noticeable difference between 1911 and 2012 is the disappearance of the glacier coming down from the Mt. Kain ridge. Other interesting change reveals itself in much less dramatic, but still thought-provoking, fashion. For example, consider the change between 1911 and 2012 in the Herbaceous category: The overall percentage of this category remains about the same across the images -- 30 to 31% of the image area approximately in each. However, only 23.5% of the category is in the same location in both photos. Figure 2, which shows the union of the herbaceous category between the two images (e.g. anything denoted as herbaceous in either image together in one image), helps visualize where the category remains the same between both images and where it differs. It is also helpful to create a visualization showing what the 1911 Herbaceous category turned into when photographed in 2012. 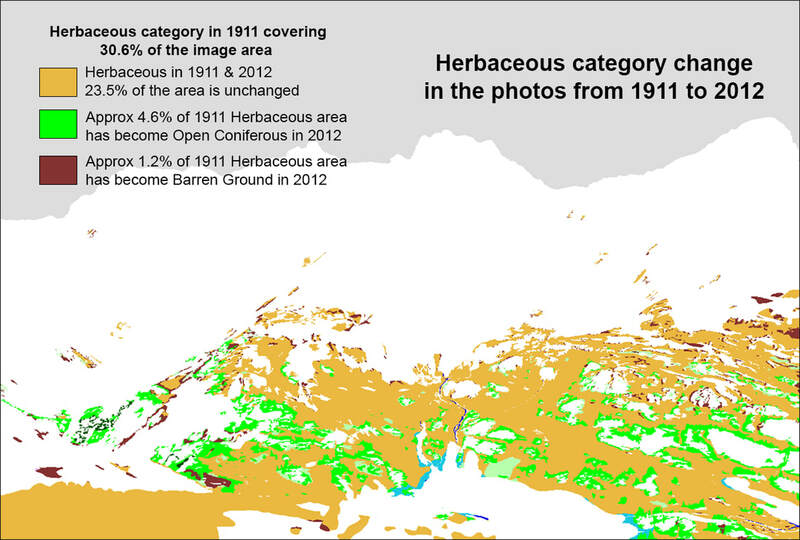 Figure 3 shows how the Herbaceous category changed between the 1911 photograph and the one in 2012. 23.5% of the image area categorized as Herbaceous is unchanged, but approximately 5% of what was Herbaceous in 1911 has become Open Coniferous in the 2012 image. 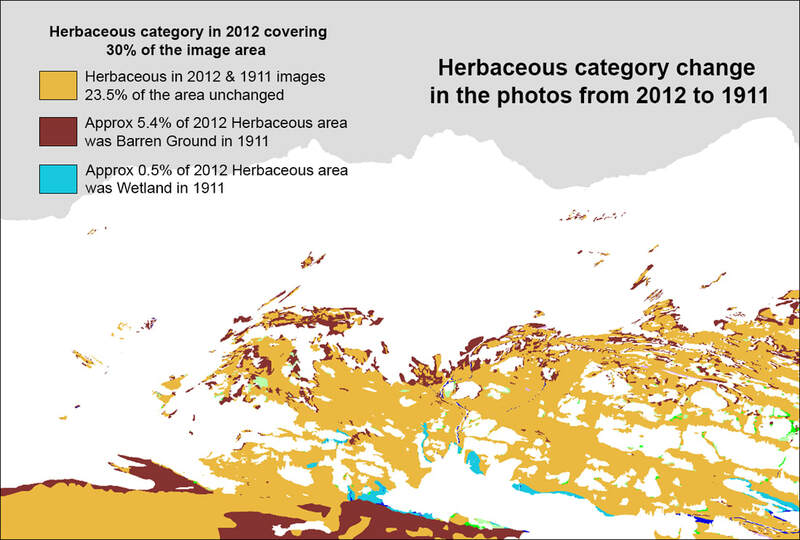 Figure 4 presents a visualization of the same category - Herbaceous - but this time looks back from the 2012 image to the 1911 one. The same 23.5% of the Herbaceous area is unchanged, but approximately 5.4% of what became Herbaceous in the 2012 image is identified as Barren Ground in the 1911 image. The "take-aways" from these visualizations are, perhaps, not too surprising -- conifers appear to have infilled and moved up-slope, while herbaceous vegetation has colonized exposed soil on barren ground. However, the ability to look 100 years into the past pushes the data gathering boundaries for processes like these back considerably further than even the earliest air-photo. As well, a detailed look at a small area like this is a good complement to the less fine-grained views of larger areas afforded by most remotely sensed data sets. Figure 2: Visualizing all occurrences of the Herbaceous category across both images. The union of this category covers 37.1% of the image area with 30.6% of the category found in the 1911 image area and 30% of the category found in the 2012 image area. Figure 3: Herbaceous category change between the 1911 and 2012 photographs. Other than the noted change from Herbaceous to Open Conifer or Barren Ground, minor change from Herbaceous to Shrub, Wet Land, and Closed Coniferous forest can also be seen. All of these minor changes account for approximately 1.3% of the image area going from 1911 to 2012. Figure 4: Herbaceous category change between the 2012 and 1911 photographs. 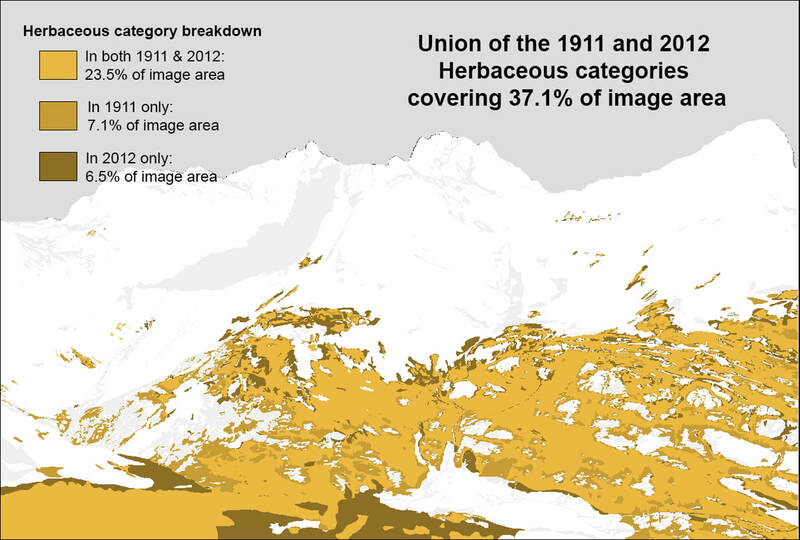 Other than areas of the 2012 Herbaceous category being represented in 1911 as Barren Ground and Wetland (5.4 and 0.5% of the image respectively), less than 1% of the 2012 Herbaceous image area was also represented as Open Coniferous, Shrub, and Snow in 1911.